i Click 'view all' to instantly compare this ok deal with offers on other top deep fryers. 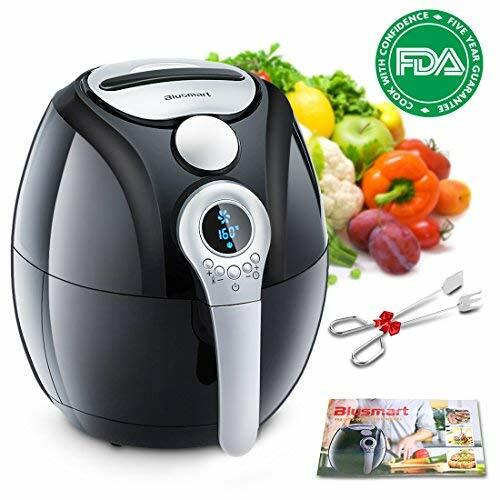 Blusmart Electric Air Fryer 3.4Qt/3.2L 1400W LED Display is currently selling at $89.99, which is its normal price. It has a lowest price of $89.99 and is selling within its usual range. Price volatility is 0.15% (meaning it does not change often), so you might have to wait a while for the price to drop. Until then this is a recommended 'ok deal'. The current deal is also the best price on this item over the last month. 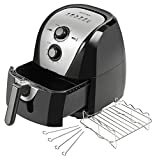 Compare the current price, savings (in dollars & percent) and Buy Ratings for the top Deep Fryers that are closely related to Blusmart Electric Air Fryer 3.4Qt/3.2L 1400W LED Display. Here is how Blusmart Electric Air Fryer 3.4Qt/3.2L 1400W LED Display compares with other leading Deep Fryers. Product Description: -Thanks to innovative built-in air frying technology, the Blusmart Electric Air Fryer gives impressive and amazing performance in frying, baking, grilling, and roasting with a tablespoon or less of oil, making fast and healthy meals and snacks have up to 80% less fat. -The air fryer is safe to use with CE, RoHS, LFGB and FDA certificated. You can handle it completely with adjustable time and temperature control system. Combining with detachable design, non-stick coating, and dishwasher safe parts, the air fryer is very easy to clean. Special Features: 1. Intelligent and easy-to-use digital control panel 2. Smart time control with auto shut-off function 3. Adjustable temperature with wide range from 170 to 400 °F (80 to 200°C) 4. 1400 Watts (120V/60Hz) for efficient and fast cooking 5. Large and easy-grip handle 6. Extremely family-friendly 3.4Qt fry basket with non-stick coating 7. Compact size of 12.7"x 14.4"x 12.7" (W x H x D) for space saving 8. Modle:HF-898LCD Include: 1 x Blusmart Electric Air Fryer 1 x Air Fryer Cookbook 1 x use manual Features? ?Eat healthy, use 70% less fat? - The hot air fryer circulates hot air and allows heat waves to flow around the food for fast and accurate results. Since delicious deep-fried dishes are made with little to no oil, crispy on the outside and juicy on the inside, healthier food can be cooked with up to 80% less fat.? ?All kinds of cooking, frying, grilling, baking and roasting? -The Blusmart Air Fryer multi cooker is essentially a fryer, oven and grill all in one. Now you can easily fry, bake, roast and grill all your favorite foods with a single cooking appliance!? ?Simple cleaning family-sized deep fryer? - With a capacity of 3.4Qt and a compact size, the fryer is designed for the whole family and fits into any kitchen cabinet. After preparing a delicious and tender fried chicken for a special day, the non-stick coated inner surface can be easily cleaned with soapy water. In addition, the basket in the dishwasher can be cleaned comfortably for you.? ?Easy to use and clean?-- Blusmart air fryer offers temperature control up to 400 degrees, and a timer up to 30 minutes which with auto shut-off feature. Operate easily---put food in basket, add less oil as your desired, choose the temperature and time then enjoy. Fast cooking performance and very short preheating time enables you to prepare a meal for the whole family in record time.